Wake up Beauty it’s time to beast. 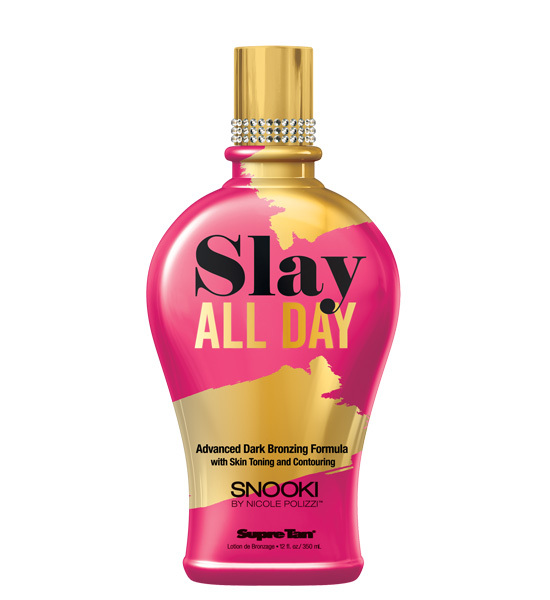 Slay All Day Advanced Dark Bronzing Formula will help boost your confident self with flawless, dark, natural color. A unique blend of Moringa Seed and Tamanu Oil help to enhance and accentuate your already perfect features while smoothing away unwanted lines. Be the girl who decided to go for it. Rise and Slay all day! • Natural Streak Free Bronzers allow skin to further darken after UV exposure for deeper, darker, longing lasting color. • HyperDark™ Tanning Technology combined with a powerful blend of Natural Bronzers helps enhance your tanning session delivering dramatically dark streak free color. • Unique Blend of Moringa See and Tamanu Oil help to even out skin tone giving your complexion a natural glow while camouflaging imperfections.